For Mattie Kenny, a win in his first league match as Dublin manager was probably the only digestible result. Given they excavated it from a two-point half-time deficit just 48 hours after six of his men had played in the Fitzgibbon Cup, the Galway native wasn't inclined to dwell on the aesthetics. "Nights like tonight, it's important to just get the win and just get two points on the table," Kenny argued. "It's about making sure the guys are showing a good attitude and being competitive and show hunger for the battle. "When they needed to step it up in the second half, I was delighted to see they responded so well." 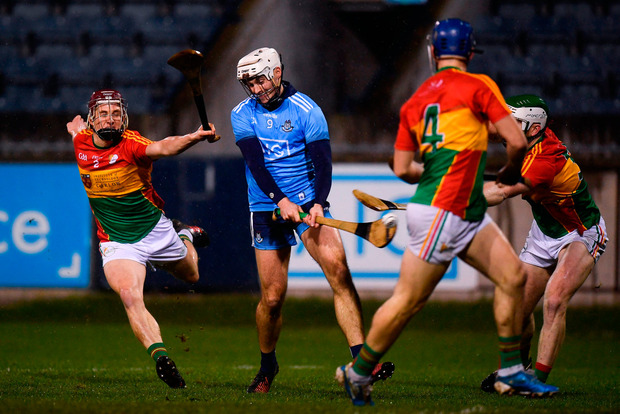 After a frenetic, error-strewn first half in which Carlow centre-forward Marty Kavanagh scored 0-8 (6f), the introduction of both Donal Burke and Danny Sutcliffe granted Dublin the twinkle in attack they had clearly lacked. Burke - one of the DCU sextet - had been named to start, but was replaced in the team by Fintan McGibb before throw-in. Testament to his sharpness was the fact that the Na Fianna man had just six second-half possessions, but scored 1-4. Similarly, Sutcliffe was all delicate stickwork and thoughtful distribution with each of his contributions in what was his first action under Mattie Kenny, a shimmering contrast to the muddied frenzy in which the game was played. Earlier, John Hetherton had been Dublin's best forward on his full league debut and caught five clean balls on a night when little was caught and nothing was clean. "It was a difficult night for hurling," Kenny observed. "Everyone is aware now that for a lot of the guys out there, it was their third game in six days. "I felt, I suppose, in the first half, we were a little bit stand-offish. "We allowed Carlow take the initiative." 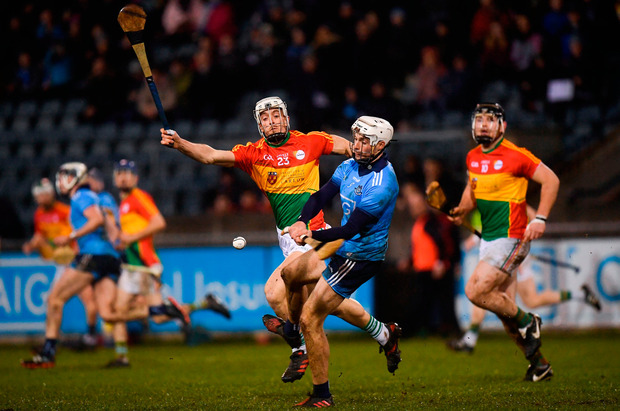 Darragh O'Connell's fourth-minute goal looked like it might point Dublin early towards the win everyone expected them to achieve, but Carlow thundered back into the game. Hetherton aside, Dublin's forwards found it difficult to win ball, but neither were the majority of deliveries particularly sympathetic to their plight. They also shot six wides in the half, whereas Kavanagh's striking was impeccable on a sloppy night. "The substitutes coming off the bench made a big impact," Kenny admitted. "It's good to see Danny back in there. And Donal Burke came in - I think Donal shot 1-4, which is a huge contribution for him in the second half." 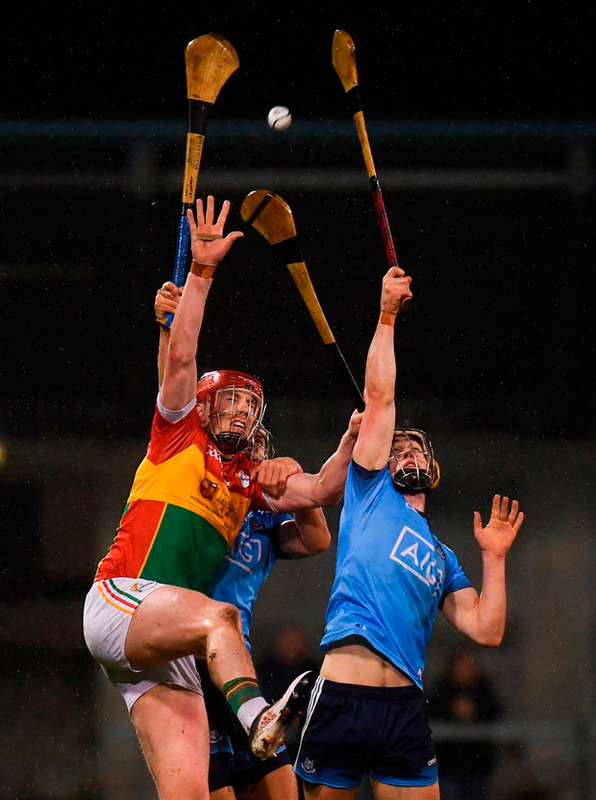 For Carlow manager Colm Bonnar, meanwhile, his team's fiery combativeness should sustain him this week before Galway come to Netwatch Cullen Park next Sunday. Though his team had been hugely competitive, they were also indebted to goalkeeper Brian Treacy, who stopped four point-blank goal efforts and stopped a point from dropping over the bar. 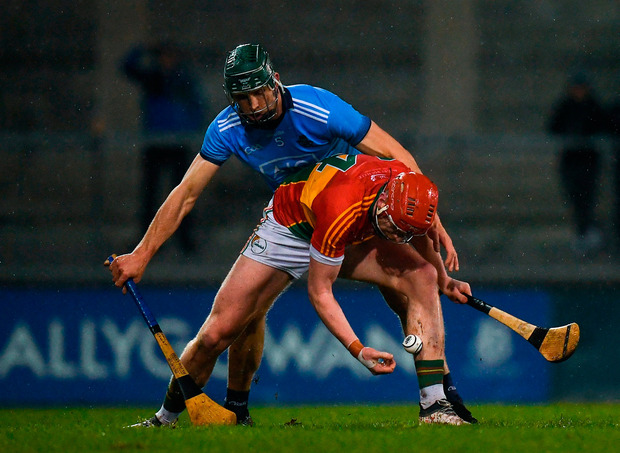 Gripe Bonnar also had a legitimate gripe over Dublin's third and game-deciding goal when Eamonn Dillon - another bright spark - appeared to handle the ball three times before passing to Burke. "To me, that's a technical foul and possibly a free out. "And that goal did change the game," he maintained. But with no relegation to worry about this year, Bonnar also acknowledged his team were in an enviable position in their first foray into Division 1B ahead of this year's Leinster SHC. "This is a learning curve for Carlow," he pointed out. "It's a case that we came up and we knew the standard that we were moving up to. "It's a hell of a standard." 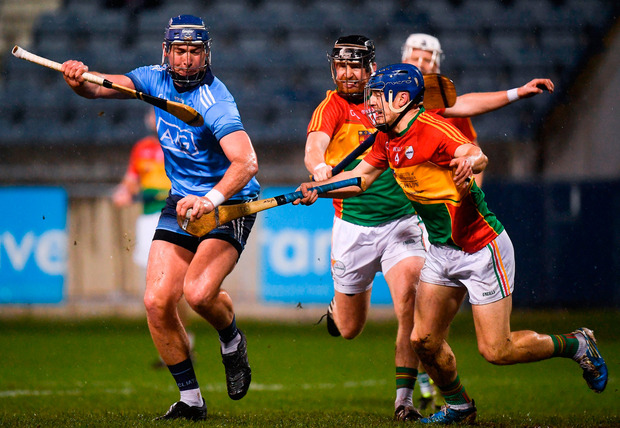 DUBLIN - A Nolan 7; P Smyth 7, E O'Donnell 7, J Madden 5; C Crummey 6, S Moran 6, S Barrett 6; J Malone 5, D O'Connell 6; F Whitely 5, J Hetherton 8, F McGibb 6; R McBride 7, L Rushe 6, E Dillon 7. Subs: T Connolly 6 for Madden (9 inj), D Burke 8 for Whitely (h-t), D Sutcliffe 7 for Rushe (48), D Keogh 6 for Malone (60), O O'Rorke 7 for McGibb (67). CARLOW - B Tracey 8; A Corcoran 6, P Doyle 7, M Doyle 6; E Nolan 5, D English 6, R Coady 6; J Kavanagh 7, S Whelan 5; JM Nolan 6, S Murphy 5, E Byrne 6; C Nolan 7, T Joyce 6, M Kavanagh 8. Subs: J Doyle 6 for Murphy (43), J Nolan 6 for Joyce (49), R Kelly 6 for E Nolan (58), G Coady 6 for Byrne (63), J Murphy 6 for M Doyle (63).